P.S. 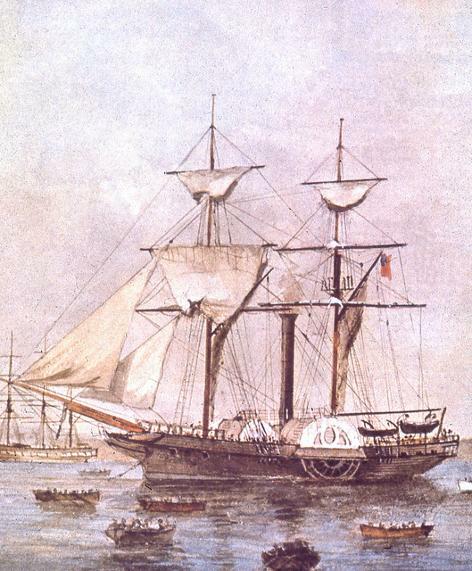 "Sophia Jane", 256 Tons, The First Steamer to Arrive in Australia, 1831, from the Braggett collection. In May, 1831 the 'Sophia Jane' (pictured above) was a paddle steamer that was the first steam ship to arrive in Australia. Built in 1826 in England, she traveled to Australia utilizing sails only, and was fitted with paddle on arrival to Sydney. The vessel was as a packet steamer used carry mail, passengers and supplies between Sydney and Morpeth and was known for its safety, comfort and reliability. 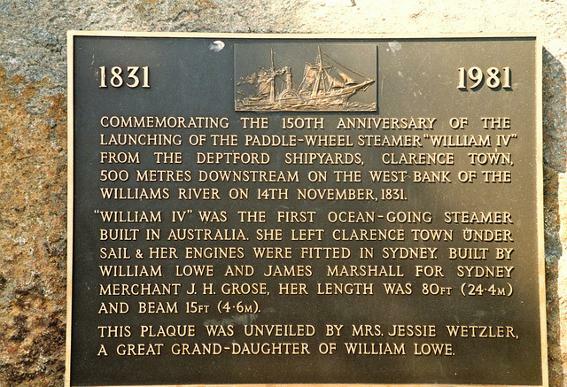 In 1832, 'William The Fourth', joined the 'Sophia Jane' with paddle steamer service between Morpeth and Sydney. These services allowed Morpeth to become a major port, and for nearby Maitland to grow substantially. Built in nearby Clarence town, 'William The Fourth' had the added distinction of being the first ocean-going steamer built in Australia. A plaque commemorating the ship can be seen in the photo below. Both ships were known as 'sixty-milers' a nickname for ships that carried cargo the sixty miles from Sydney to Newcastle. Hoskin, John. Flotilla – Australia. Port Australia. 2007. Web. 7 February 2013. <http://www.flotilla-australia.com>. Walsh, Brian and Archer, Cameron. Maitland on the Hunter. Paterson, NSW: CB Alexander Foundation, n.d. Print. 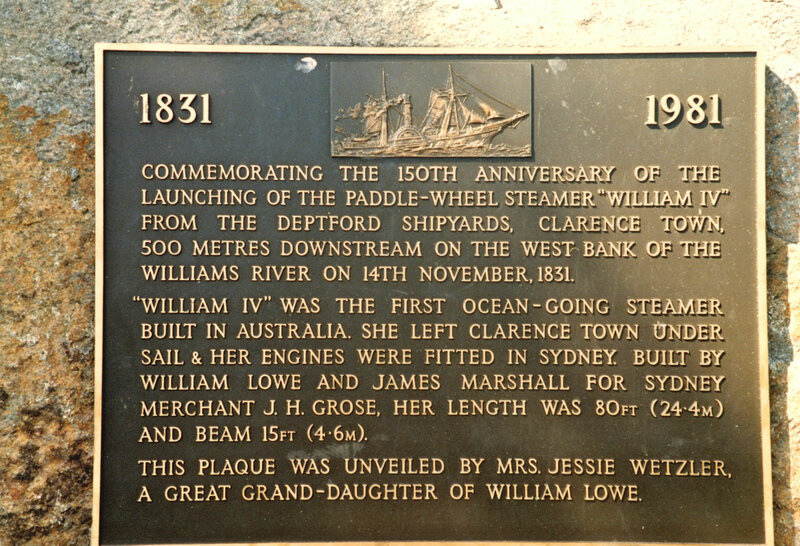 Commemorative Plaque, Clarence Town, NSW, Australia, 1987.